Flat Rate Shipping only $5.95 for orders up to $12.99. Perfect self defense tool for joggers, runners, hikers, skaters, roller bladers, etc. Anyone on the move will appreciate the simplicity of this pepper spray tool. The jogger pepper spray consists of really HOT, effective, 2MM SHU pepper spray plus a jogging hand strap. The strap is made of elastic nylon with velcro adjusment and will keep your spray ready without having to fumble through pockets, backpack or purse. and shoots out to 12 or more feet in a powerful stream easily drenching your target and making his eyes slam shut. This will give you time to escape and get help. Be aware that the brand that advertises 35 shots squirts a thin, faint mist in order to get that many shots (They make the nozzle smaller). It takes a good formula and effective delivery method (read, enough formula) to make sure the bad guy gets his. If you are a runner you want your pepper spray to act fast, Police Magnum will provide the most effective delivery and the best value because it has been proven to work. 3/4 oz (.75) of Super Hot Pepper Spray attached to an adjustable elastic hand strap. Pepper Spray can't help you if you can't get it out in time to face your attacker. Many attacks come from behind or outside your field of vision. Having the pepper spray in your hand is a HUGE! advantage. In fact, many confrontations will be avoided if the predator sees you have a weapon that can give him trouble. They'll just move on to someone less prepared. Being prepared is truly half the battle. Great for dogs that bother you, too. Does not contain tear gas (which does not work on dogs). Other brands sell you 18 grams which is only .62 oz. Get more bang for your buck with this excellent and effective pure pepper spray. 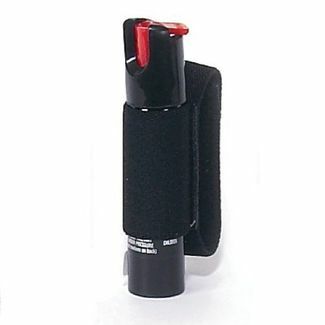 This pepper spray product can only be shipped by ground service.Shipping Restriction: Must use ground service, any other method will be changed to ground.